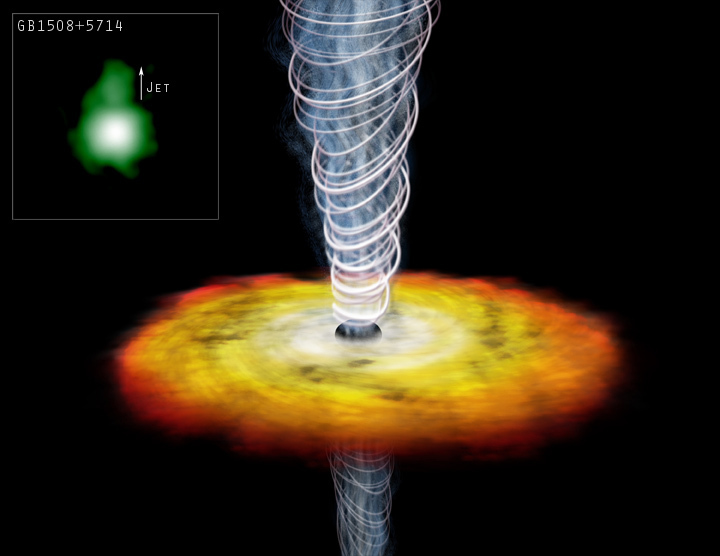 The Chandra image of the quasar GB1508+5714 (inset) reveals a jet of high-energy particles that extends more than 100,000 light years from the supermassive black hole powering the quasar. At a distance of 12 billion light years from Earth, this is the most distant jet ever detected. The discovery of this jet is especially significant because it provides astronomers with a way to measure the intensity of the cosmic background radiation about one billion years after the Big Bang. Quasars are thought to be galaxies that harbor an active central supermassive black hole fueled by infalling gas and stars. 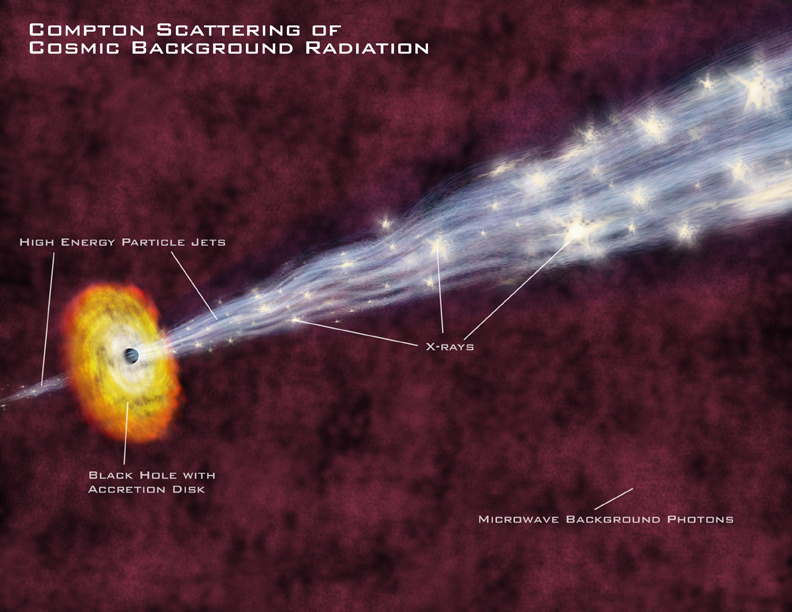 This accretion process is often observed to be accompanied by powerful high-energy jets, which is depicted in the artist's illustration. As the electrons in the jet fly away from the quasar at near the speed of light, they move through the sea of cosmic background radiation left over from the hot early phase of the universe. When a fast-moving electron collides with one of these background photons, it can boost the photon's energy up into the X-ray band. The observed X-ray brightness of the jet, which depends on the power in the electron beam and the intensity of the background radiation, is consistent with the predictions of the standard Big Bang model. The jet's brightness also implies that enormous amounts of energy were deposited in the outer regions of the host galaxy of the quasar at a very early stage. This energy input could have had a profound effect on the evolution of the galaxy by triggering the formation of stars, or inhibiting the accretion of matter from intergalactic space. Scale Image (inset) is 9 arcsec per side. Coordinates (J2000) RA 15h 10m 02.90s | Dec +57° 02´ 43.40"